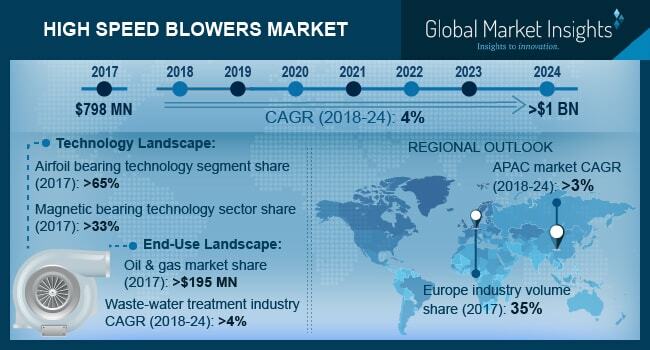 High Speed Blowers Market size is forecast to exceed USD 1 billion by 2024; according to a new research report by Global Market Insights, Inc.
Strong product demand across wastewater treatment and oil & gas industry will positively boost the high speed blowers market size by 2024. Growing awareness for waste water treatment process across industrial facilities in order to reduce the impact of effluents will help trigger product demand which in turn will drive the high speed blowers demand by 2024. Companies have been making substantial investment to improve the waste water facilities to improve its overall efficiency. For instance, a total of USD 8.6 million project has been initiated to upgrade Grissom Aeroplex wastewater treatment plant in Peru. It was an out of date facility which was acquired by Peru Utilities from the U.S. Air Force. The project includes upgrading the plant’s design and various other architectural amendments. Furthermore, a total of 20 waste water treatment plant are being upgraded with modern technologies across the U.S. and South America which will help expand the turbo blowers market size in the forecast time period. Massively complex product functions along with high prices are probable to obstruct the overall high speed blowers market size by 2024. Lack of trained personnel for handling the device is another major impeding factor for the overall high speed turbo blowers market size by 2024. Nevertheless, the product’s high speed, efficiency and wide range of functions will create ample opportunities for the turbo blowers market size by 2024. High speed blowers market for magnetic bearing accounted for more than 33% of the global turbo blowers market in 2017. Magnetic bearing technology creates higher speeds for the blowers which moves up to 50,000 RPM without any conjectures. This technology is required for operations consuming minimum power and energy. These blowers consist of sensors which regulates its performance and power usage. The sensors also statistically analyze condition and operating trends, health of the machine and any signs for the system warnings. Product finds extensive applications in oil & gas exploration activities where continuous high speed is required in the cooling towers with the ability to take larger loads. High speed blowers market size for waste water treatment is projected to rise at a CAGR of more than 4.0% by 2024. Waste water treatment processes are widely applicable across industrial and residential sector due to the rising environmental & aquatic concerns. Scarcity of clean water, danger to aquatic lives, growing water borne diseases etc. are some of the major reasons for treating waste water. Several European nations are upgrading and developing waste water treatment plants to contest its water scarcity which will directly propel the turbo blowers market size by 2024. Asia Pacific high speed blowers market size is likely to grow at a CAGR of more than 3% by 2024. Solid waste and lack of proper sanitation are polluting the ground water, which is not only affecting the aquatic life but also the human health. There is lack of awareness and willingness to pay for proper sanitation in the rural areas of the region. Henceforth, Asian Development Bank (ADB) is escalating its schemes for wastewater management and reuse. The bank is providing considerable funds to wastewater treatment facilities to expand its initiatives which will trigger the product demand and will subsequently drive the turbo blowers market size by 2024. High speed blowers market players are Xylem India, Atlantic Blower, United Blower Co, Zi-Argus, Atlas Copco, Eminent Blowers, Aerzen Turbo Division, Spencer Turbine, APG-Neuros and HSI Blowers. The major players are making considerable investment for strategic acquisitions of small or medium scale players to gain competitiveness in the market. For example, Atlas Copco North America LLC has completed the acquisition of Houston Service Industries, Inc., a U.S. manufacturer of low-pressure blowers and vacuum pumps in January 2012.